I arrived early, about 7 am, on the red-eye, into the fair weather of Orlando. The people that I encountered in the short trip have been uniformly nice and polite. Remarkably so. I want to make a quick mention of the fact that the FAA has decided, or is the TSA, that guitars will no longer be allowed on the plane. Now, it is not as if I want to bust out with dong on each flight (even when flying song), but this is clearly discrimination. Rabbi Dubov and Chabad of Greater Orlando deserve a shout out because they loaned us a sefer torah and siddurim. I pulled up Friday morning in my rented EZ Car Rental Durango (thanks Rafi!) and we loaded up. What an oasis, after passing miles of trailer homes and subdivisions, a the Rabbi made me feel right at home. We talked torah for a while and then I had to head off to do some shopping at Publix and find the conference center. The conference center is modest, but with the most remarkable blues concert! We were all shocked and awed by the Smoking Torpedos, although I only heard them muffled through three walls. Still, it sounded like authentic blues. The program and participants were top notch. It was a meeting of some of the best minds in the Israel advocacy world under one roof for the weekend, and 120 students from about 45 campuses stretching from California to London. The students were uniformly interesting and involved, with nearly everyone attending everything. Not too shabby. We began with a Rabbi Yonah led singing service. We enjoyed a delicious dinner, and then hunkered down for some pretty fascinating discussions. One, by my old pal Neil Lazarus, of Awesome Seminars who I haven’t seen in like 15 years. Also there was a group from the UK who were seniors in high school. 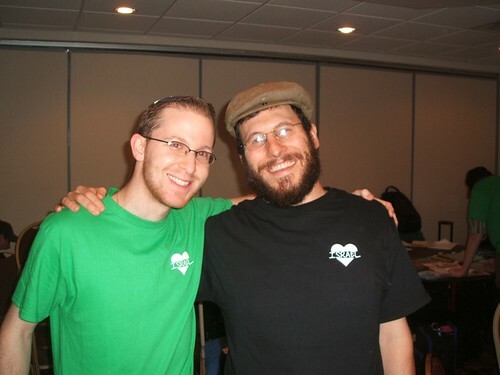 They brought along a couple of Rabbis two, and so we even had a beis din. We managed to have a nice minyan on Shabbat Morning, although we had to compete with a Barter/flea market show that had been installed in the hallways, outdoors, and other places around the hotel, much to all of our surprise. Of course the organizers and several of the vendors were Jewish and wished us all Shabbat Shalom. They did after lunch one of the best programs. 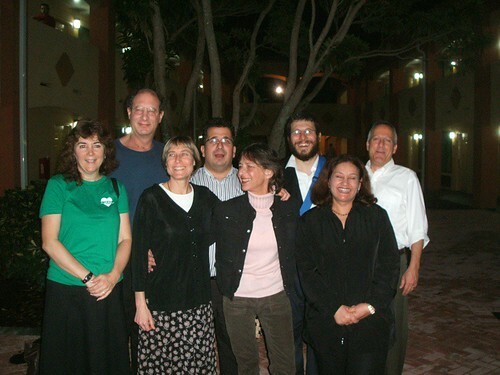 In this program, several staff members “become” well known anti-Israel speakers. This role playing is very effective for students to learn how to talk in a public setting. Neil had them working on some great strategy. I took a shabbos nap too. 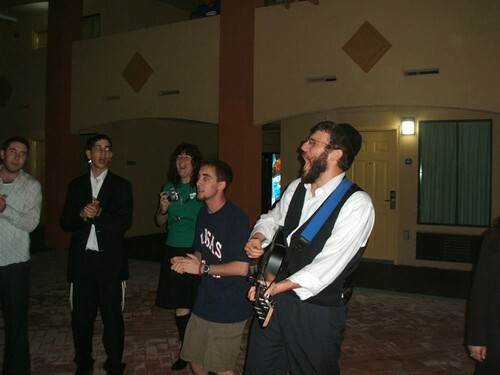 We had a dancing singing havdalah in the courtyard, and cemented our “never invite back these Jews again” status. And not because we were in any way disruptive, but just everyone asked to be let into heir rooms because of the elctronic locks. The Muslim gent who ran the place just could not undersand our issues with the locks. Tried as I could, it was no use. One of the speakers, a christian, opened my door so I could get into sleep. On Sat night we piled on buses for Orlando Universal’s City Walk. So, what is this all about? I confess to have had absolutely no fun at all. it is so contrived and commercial, there is nothing redeeming about it, save the Starbucks where you get some nice coffee. but you don’t need a whole city walk for this. The most bizarre thing, or one of the most, was the Bob Marley CLub. All night every-night, a Bob Marley look alike band and singing. This was the ultimate in kitsch. OMG! I’m going to go get some sleep now….on the plane home!